For the first 20 or 30 pages, I wasn’t sure of the role magic would play in the narrative. It’s clear that this is the contemporary world with slight differences, but because the text is written in third person limited (for both Lace and Cluck) I wasn’t sure what was “real” magic and what was exaggerated in a character’s mind. I don’t actually think this is a flaw in the writing though. McLemore is a deliberate craftsman who reveals information when she wants you to have it. In those opening pages, the reader should feel distrustful of all facts about both families, placing our sympathies with our two leads. Cluck and Lace each exist on the fringes of their performing families. For their entire lives they’ve both been told to avoid their rival family’s black magic. So when they finally do meet they don’t know that the other is a member of the family they’ve been taught to hate and blame for any misfortunes. McLemore doesn’t do this to have them fall in love outside of that knowledge though. In fact, Lace finds out fairly quickly that the boy who saved her life is her family’s enemy. It’s a neat trick that serves to obscure their inevitable attraction to each other, which is well worth the wait. I could write about technical skills; stunning word choice, McLemore’s excellent ear for dialogue, sounds, and rhythm, and the sensory experience that is reading this book. Or I can just SQUEE because this book gave me FEELS like nothing else has this year. I had goosebumps during some of these scenes with Cluck and Lace. Even their names (which are quite ridiculous) didn’t give me pause during some very intense scenes in which the two leads weren’t even touching. Their connection is never implausible because that intangible spark between them is so palpable. Cluck and Lace’s relationship embodies the novel’s main idea about duality and generations. This is a thematically rich and ambitious text. McLemore develops her ideas through the characters and setting. The gulf between the families is demonstrated in the shows they perform. The Corbeaus are creatures of the air, dancing gracefully through the branches of trees with huge wings strapped to their backs. The Palomas wear custom mermaid tales as they swim in a lake. Again, the idea isn’t new—the air/water dichotomy reminds me of the line from Fiddler on the Roof: “a bird may love a fish, but where would they build a home together?” What sets this story apart is that Cluck and Lace are disenfranchised outsiders in their families. Although there’s a clear balance in the skill and success of the Corbeaus and Palomas, more time is spent with the Corbeaus and McLemore uses imagery associated with flight far more than anything related to water. A plot reveal about Cluck late in the novel explains why more time was spent exploring him and his familial relationships. A focus on flight also fits nicely with the larger theme of the novel. A variation on the phrasing of the book’s title recurs throughout the text to remind the reader that this is a story about the burdens we carry—sometimes of our own making, sometimes of our ancestors—that can keep us from flying. There’s a clarity of purpose here because the execution is in every word and sentence. 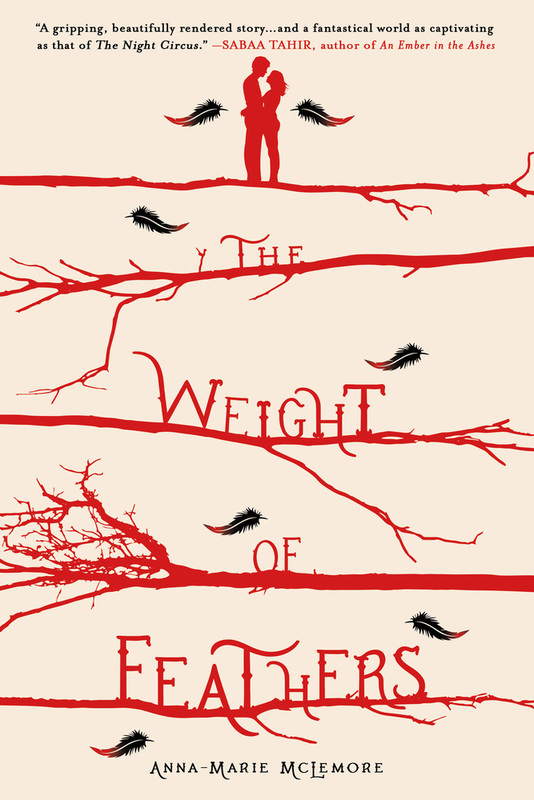 The Weight of Feathers is written in English with generous amounts of French, in the Corbeau sections, and Spanish, in the Paloma sections. McLemore is strategic with her contextual transalations. For example, when Lace is around the Corbeau family and they use French phrases that they don’t wish for her to understand, they aren’t translated. When she is with her family or Cluck with his, the Spanish or French is translated when the meaning can’t be gleaned from context which is a rare occurrence. The non-English words and phrases are italicized but I think in this case it makes sense because of the frequency with which they are used. The seamless transitions between English, French, and Spanish are technically well-done but they also show that although language can be a barrier, it’s not insurmountable. I think there’s a lot of Printz potential here and a very good chance for the Morris, but if McLemore doesn’t receive any recognition this year I won’t doubt that her name will come up again in years to come. McLemore is a very descriptive writer. At times she can get in her own way by providing too much detail or one too many metaphors, and this is the only area where she’s not totally careful about everything on the page. This is a common problem for a debut author so I’m more forgiving in this case than I would be for a more seasoned writer. The plotting gets a little muddled at the end and sometimes the action isn’t quite clear, but because the settings were so well done, it wasn’t difficult to orient oneself during faster paced scenes. The magic in this world is subtle, and by the end, surprising in where it shows up.